Hi guys, how are you all…Totally missing you all and my blog.I am back here after my busy busy schedule,dont want to miss my blog baby.Here is the Quick Recipe , Vendakkai Poriyal.Aishu’s fav and almost this will present on her lunch box.This can be make on many ways,but this is the most easy and quick way of making poriyal.This goes well with Sambar rice or any variety rice. 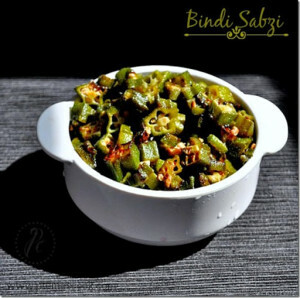 My fav combo with simple rasam or curd rice. 1. Wash okra and wipe it. You can also spread them on a plate or towel and let it dry. 2. Trim the edges and cut them into ¼ inch roundels. Chop the onion finely. 3. Heat a pan with oil. Add mustard seeds and when they splutter, add urad dal and let it get roasted to golden brown. 4. Add onion and sauté till it turns translucent. Now add the okra and cook for a minute over high flame. You can see the okra beginning to stick to the pan. 5. Reduce the flame and add curry leaves and salt and mix well. Do not close the pan with a lid. 6. Cook over low flame for 4-5 minutes till the okra gets cooked well and becomes dry. Keep mixing in between.Finely add the grated coconut and fry well.Switch off the stove and transfer it in a serving bowl. While getting ladies finger , always check by bending the tail part if it breaks easily then its tender and good to go. 1. 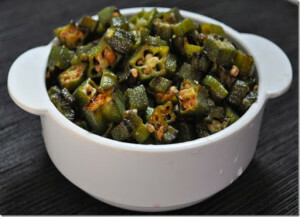 You can chop the vendakkai/okra the day before and store it in an airtight container to prevent them for sticking together while cooking the next day. 2. Never ever close the pan with a lid while cooking okra. 3. Add salt only after the vendakkai is half cooked, else the salt will bring out the water from the okra and they will stick together. Looks delicious, would try this method when I make next time. Delicious okra curry, who can resist to this mouthwatering dish.